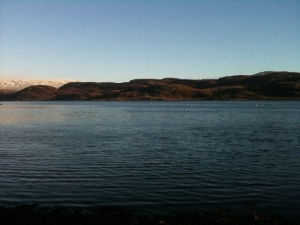 Yesterday the loch was calm, the only trace left by Hurricane Bawbag was a smattering of snow on the hills. All’s quiet in the west today, but on Thursday Portavadie was pummelled to within an inch of its life by Hurricane Bawbag. It screamed its arrival, roaring and howling, unleashed and wild. Mighty gusts brought belts of rain and hail that hammered at the door. I watched from the window, jumping as gravel, whipped up and hurled at the cottage, smacked the glass. Telephone wires swung in giant loops, shuddering and straining to break free from their poles. One lone tree stood in the field, brittle branches waving, crazed, to the skies. Two small firs, just babies, seemed less bothered. They were pliant in the onslaught, supple limbs bowing until their tips touched the ground. Bits of plastic – a dustbin lid and a couple of plants pots – clattered up the lane, hurtling along like they were heading into town for the night. And the sea. I’ve never seen it so furious. Giant waves, row upon row, pushed onshore, relentless, crashing over the pier and smashing onto the rocks. Birch Isle was being sucked under. A low mist whirled and danced over the surf. As the sky darkened and the sun set, this mad, boiling loch turned a menacing pink. 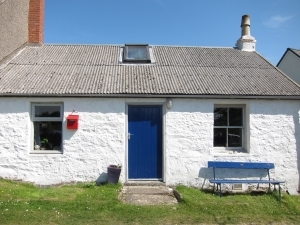 The cottage is small and squat – perfect for the wild and windy west coast. Later that evening the electricity went off, so I went to bed. I lay in the dark as the hurricane raged on and thought of the people who’d lived here over the years. They too must have listened to the winds howling outside, safe and protected by these four walls. Then, as suddenly as it came, the hurricane went. But it left behind (along with a smashed back fence and two bemused chickens) a sense of how enduring the cottage is; just what it’s stood up to over time. This squat little home (close to the ground like all proper Highland things are) with its thick walls, is so perfectly formed for this weather-beaten place, this wind-battered land. 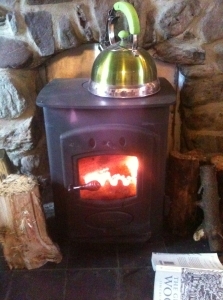 In the silence after the storm all I could hear was the creak of a floorboard and the sigh of a beam – the cottage settling, relaxing its flexed muscles. I almost caught it mutter under its breath ‘another one taken care of’. Hurricane Bawbag was, after all, just an awful lot of wind, and there’s nothing new about that around here.